Whilst in no way a generic group, this rather contrived category of ceramics bridges the gap between the early (18th century and earlier) Continental and domestic pottery and the so called Art Potters of the later 19th century. Something of a catch all that includes Staffordshire pearlware and pottery portrait figures, transfer decorated wares and a whole series of hybrid pottery porcelain bodies such as jasper wares and their ilk, the black basalts and even parian ware. 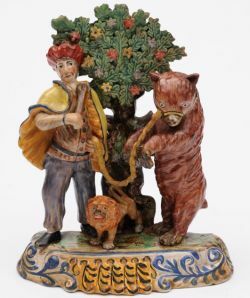 A Staffordshire pearlware performing bear group. There were a multitude of Staffordshire pot houses that catered for the whole spectrum of tastes from the often complex groups on table bases produced by Obadiah Sherratt and his contemporaries. Subject matter included Bull Baiting and Dancing Bears as well as amusing social commentary pieces such as Tee Total, Ale Bench and the Tithe Pig Group. Reflecting the popular culture of the time, there were portrait groups of the famous and infamous whether it be royalty, admiralty, opera singers or criminals and, of course, the ubiquitous Staffordshire Spaniel. 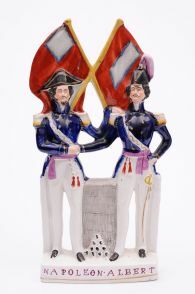 A Crimean Period Staffordshire pottery figure Napoleon and Albert. The invention of transfer printing transformed the ceramic industry, allowing it to produce multiple copies of engraved images onto a ceramic body. Invented in the 1750s, primarily for use on porcelain, by the end of the century it was more widely used on pottery. 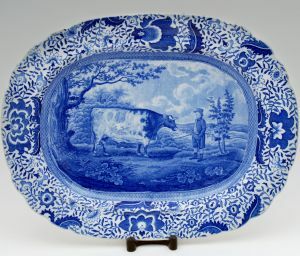 A blue and white plate transfer decorated with The Durham Ox, circa 1810. Initially Chinese inspired designs were favoured but the heyday came during the first three or four decades of the 19th century, with improvements in the technique and the use (or sometimes misuse of) existing engravings. These vintage years included named and recognisable topographical views both home and abroad, flora, fauna and humour and literary subjects being popular. Perhaps the most desirable pieces from this period are the Durham Ox, the Shipping Series or the Indian Sporting Series. The advent of the 1842 Copyright Law was good news to engravers and publishers, but bad news for enterprising and plagiarising potters. The decades afterwards saw a decline in quality and a drift into rather romanticised pseudo Oriental or Continental views and rather a raft of seemingly identikit designs cobbled together from accumulated engraved 'spare parts'. A Wedgwood rosso antico teapot. King of the hybrid body was undoubtedly Josiah Wedgwood who invented the black basalt in 1768 and in the following decade the ever popular jasperware, rosso antico, porphyry and cane ware bodies all utilised for all manner of decorative vases and urns, useful table wares, bas relief plaques for collectors and furniture makers alike with a heavy bias towards classical Greco Roman decoration. 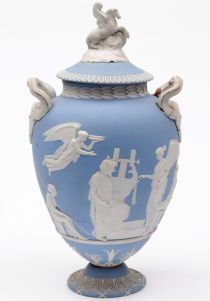 A Wedgwood blue jasper ware vase decorated with The Apotheosis of Homer. 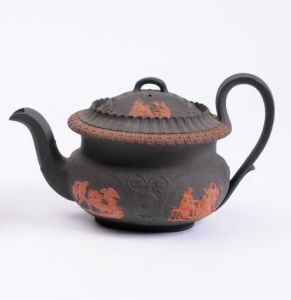 Both the decoration and these 'new' bodies were much mimicked by other makers and had an almost endless period of popularity with black basalt and various shades of jasper ware still in production today. 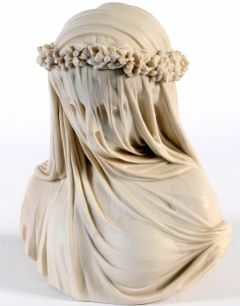 A Copeland parian bust The Veiled Bride, dated 1861. Whilst Wedgwood in turn used the primarily white bisque porcelain or parian body, it was not one that he was responsible for; that accolade initially was Sevres, but during the 1840s Minton and Copeland started manufacture of parian, largely as a result of the opportunities offered by the invention of Cheverton's reducing machine – a sort of large etch-a-sketch contraption that allowed accurate small reproductions to be made of existing statuary. Especially popular amongst the Art Unions, many domestic factories produced a range of parian 'sculpture', peak production being between 1850 and 1900.